Complex relationships between species such as birds and grazers are common, but often unrecognized by over-simplified wildlife management theories. As a result, wildlife managers routinely attack species whose interdependence we do not understand. For example, in Texas, tax policy rewards landowners who attempt to eradicate brown-headed cowbirds, a species that has existed symbiotically with bison (and cattle) and other bird species, for countless millennia. NOTE: This article is taken from NYTimes.com and was originally published on November 29, 2017. Author is Joanna Klein. Photos by Rob Found. Feature image on post is by Ian Froome. 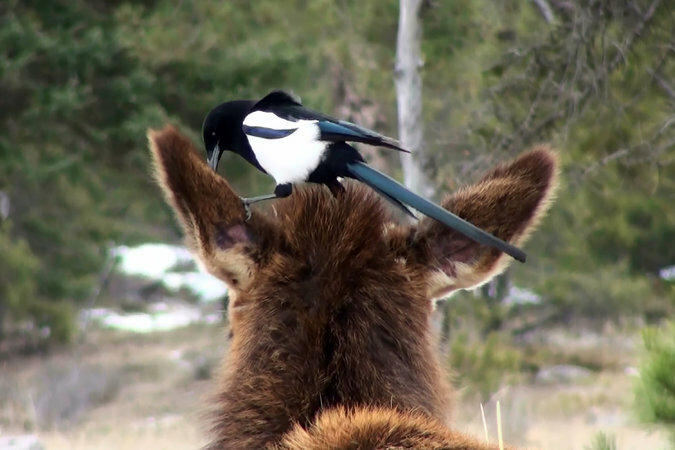 Magpies will eat ticks that drain the blood from elks, but a scientist found it takes the right mix of elk-magpie personality for the relationship to work. To study the magpies, he attracted the birds to 20 experimental sites with peanuts on tree stumps. During more than 20 separate trials with different magpies, he judged each bird’s behavior relative to the other magpies in a trial. Like the elk, he measured flight response, social structure and willingness to approach items they hadn’t previously encountered (a bike decorated with a boa and Christmas ornaments). He also noted who landed on a faux-elk that offered dog food rather than ticks (a previous study showed magpies liked dog food as much as ticks). 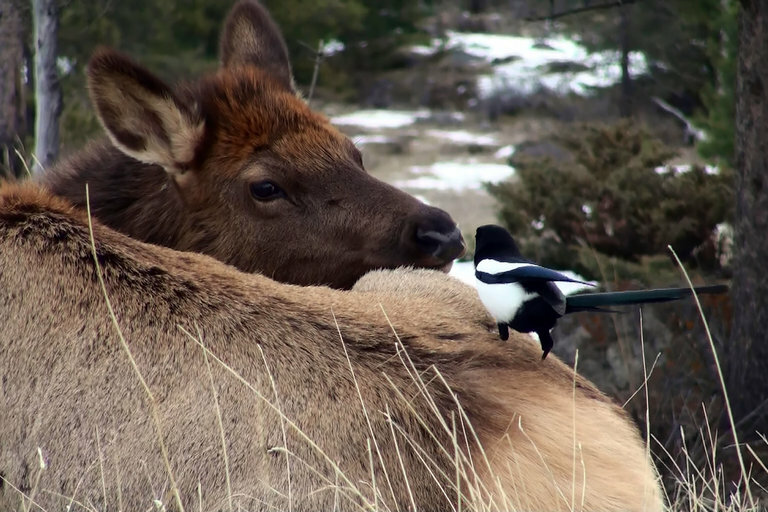 Bolder elk and magpies exhibited riskier behaviors like tolerating the experimenter, approaching novel objects and fending off animals. About half of the elk let magpies land, and just over half the magpies landed on the fake elk. And it was the shy elk and bold magpies that were more likely to engage. This was counterintuitive for an elk: eyeballs offer easy targets for hungry magpies. But magpies also eat winter ticks. This tick species waits on tall grass for passing animals, like elk and deer, but preferably moose, which don’t notice them until it’s too late. They clump together and infest by the thousands, remaining on a host all winter, expanding to grape size when fully engorged. They can drain all the blood from a moose calf, and are credited with giving the moniker “ghost moose” to those that groom themselves hairless. Elk have fewer winter ticks than moose, perhaps because they’ve had more time to evolve coping mechanisms, like habitual grooming. But hair loss around the neck is still a problem. Two decades ago, Bill Samuel, a retired moose biologist and author of a definitive book on moose and winter ticks, foundsome moose also evade the pests by tolerating magpies. Perhaps, Dr. Found thinks, shy elk gain an advantage over bold elk and compensate for their bashfulness by accepting magpies. Few studies have examined the role that personality plays in shaping interactions between species, especially mutualistic interactions. In one study, however, aggressive spiders in so-called mutualistic relationships suffered compared to docile spiders. And in another study, bold cleaner fish tended to cheat mutualism by consuming the protective mucus around their client fish and swimming off instead of eating parasites. Dr. Found thinks personality reveals a messier mutualism than once assumed. But there’s a missing piece to this puzzle, said Alison Bell, who studies personality in fish at the University of Illinois, Urbana-Champaign. This could be a three-way relationship: What’s the tick’s role? Does tick personality factor in? And does this behavior extend to all elk and magpies, or is it just some western Canadian quirk? While more research remains to be completed, Dr. Found’s peculiar observation, described for the first time, demonstrates the complex role personalities play in the animal kingdom. Whether emotional concepts or just behavioral tendencies, personalities exist in all kinds of species and can influence the interactions among and between them. Some combinations work; some don’t. In this case, opposites attract — and it seems to be working. Thank you for posting this on your blog. There are dramatic differences between magpies and cowbirds. The primary reason for cowbird eradication is the fact that they are nest parasites and can be very detrimental to a large number of native species that historically were not parasitized due to the fact that cowbirds were a plains species and many species now affected have not evolved nesting habits that protected against cowbird parasitism. Reduction in cowbird numbers has been shown to benefit many species of woodland birds thus contributing significantly to preserving species diversity. Magpies and cowbirds are apples and oranges. And in the case of cowbirds the negatives far outweigh the positives. Over and over, ‘competitive’ species turn out to be ‘complimentary’. The complexity of these systems far exceed our ability to understand them. Over and over, eradications of so-called ‘invasive species’ (many of which including cowbirds are natives) wind up harming the specific species they are sincerely meant to protect – and many others we never thought about. My takeaway is that agronomic principles applied to ecological systems will almost always cause harm. Sorry to disagree, thanks for writing. Eradication of cowbirds is not possible. But controlling their numbers in habitats where they are causing drastic reductions in other bird species is a viable and successful management option that has proven to bring the numbers of affected species like golden-cheeked warblers and black-capped vireos back significantly where cowbird control is practiced. The operative word here is Control not Eradication. I realize most mainstream wildlife managers disagree with me on this. From my perspective however, today’s wildlife ‘management’ methods originated in the ag departments that host the wildlife programs where most wildlife managers received their training; small wonder they approach wild species as a farmer would manage field crops and weeds.